After taking on the Rock Gym leader Johan Lindberg, the crew of the newly christened GCS Dunsparce traveled to the Alexi System in Romanov space to deliver the package they had received from Arn Hondo. The coordinates he provided them brought them to a Romanov research station in orbit around an uninhabited swamp planet. Dmitri and H talked their way in and were able to see that the package contained some kind of ancient fossilized Pokemon. Arlon snuck further into the facility to discover that the scientists were cloning an army of these Pokemon and cybernetically augmenting them with powerful weaponry. “This place is bad news,” Arlon announces when he arrives back on the ship. “What do you mean?” Morgan asks him. As Arlon detaches the Dunsparce from the docking tube, Morgan hacks into the station’s network and manages to grab a big package of data before the ship flies out of range. Arlon takes the ship down to the swamp planet so that the crew can discuss their plan of action. “What did you manage to find?” Arlon asks Morgan. “I guess we’ll have to wait before we do anything about the scientists,” Arlon tells the crew. “In the meantime, I would like to conduct some experiments on this planet using that goo we created!” H exclaims. The crew disembarks from the Dunsparce and heads out into the swampy wilderness to explore and experiment. H injects a nearby shrub with his a sample of the goo which causes it to turn black and two purple flowers with glowing pink cores appear on it. H pokes a stick through one of the cores and the tip emerges out the other. “Interesting,” H says to himself. He determines that the flowers seem to be miniature warp gates and any object placed into the core of one flower appears out the core of the other. Dmitri picks one of the flowers which causes a burst of energy to shoot out from it as it implodes in his hand. Then the shrub shrivels up and dies. “That was certainly unexpected,” H comments. The crew moves on and arrives at a small pond. Arlon spots a loan Froakie sitting on a lilypad “That would make a nice addition to my team,” Arlon says to himself. He reaches to his belt and pulls out a ball. “Hydra, use Dragonbreath!” he commands as he releases his Deino. The Pokemon lets out a surge of dragon flames which strike the Froakie and knock it off the lilypad into the water. In response to the new threat, the three lilypads in the pond emerge from the water, revealing themselves to be Lotads! Seeing this, Morgan releases her Eevee. “Yvonne, get in the water and attack one of them,” she instructs the Pokemon. Yvonne jumps into the water and begins swimming toward the Lotads. Returning their focus to the battle, the crew mop up the lotads and Morgan, Dmitri, and H each catch one. When the fighting ends, Dmitri pulls out his fishing rod and begins fishing in the pond. After a few minutes, he gets a bite and reels in a Magikarp. He pulls out a Pokeball and throws it at the fish Pokemon, catching it with ease. Dmitri casts the line out once again, and reels in another Magikarp. “I just caught one of these…” Dmitri grumbles. “I’ll take that one, mate,” Arlon tells him. “I’ll take it,” Morgan tells him. “Yvonne, use Quick Attack!” The Eevee runs at it and delivers a powerful hit. Morgan then pulls out a ball and tosses it at the Totodile, capturing it without much struggle. “Go ahead, mate,” Arlon tells him. H returns to the ship to get another sample of goo before the crew continues exploring. “We need to find a larger specimen,” he tells his crewmates. “How about that tree?” Dmitri suggests, pointing to a large tree in the distance. “That will do nicely,” H tells him. He sets off toward the tree with the rest of the crew close behind. As they approach, the swampy forest gives way to a large clearing with sparse trees, the large one looming in the center. H wastes no time in injecting this tree with the goo. After a few moments, glowing pink sap starts oozing from the wound that was made in the tree. “I still have this bottle of vodka.” Dmitri offers. Dmitri pulls out the bottle of vodka and then proceeds to down the entire bottle. When he finishes, he falls on the ground coughing and sputtering. H checks to make sure he is still breathing. “He’ll be okay,” he announces. “Uh, guys. The tree is turning black,” Arlon tells his crewmates, drawing their attention back to the tree. Glowing, pulsating veins appear along the surface of the blackened bark. Morgan hears a pounding inside her head, throbbing to the rhythm of the pulsing veins. “We should get out of here!” she shouts. Suddenly the tree vanishes, leaving a giant hole where it once stood. “I don’t think that’ll do any good at this point,” Arlon tells her. He reaches for a Pokeball and starts backing away from the hole. He sends out his Deino and the others follow suit, releasing their own Pokemon. “I’ve got a real bad feeling about this,” Arlon tells his crewmates. As if on cue, the tree appears behind them and swipes at them with its large limbs! With his quick reflexes, Arlon dives out of the way but but the others and their Pokemon are not so lucky. The rest of the crew are knocked to the ground and Dmitri’s Beldum and Morgan’s Solrock are completely knocked out. Dmitri raises his hand and unleashes a blast of energy at the Trevenant, sending it into a confused rampage. “Now, Gigan, Wing Attack!” Dmitri shouts as he releases his Scyther. The Pokemon charges at the Trevenant and slashes at it with her wing but she doesn’t appear to leave so much as a scratch. “Hydra, use Crunch!” Arlon commands his Deino. The Pokemon runs up the the large tree and lunges at it with her teeth barred. Unfortunately, Hydra is unable to make contact. The Trevenant looks down at the Dieno and swipes at her, knocking her out. “Alright, you’re up next Crocuta!” Arlon shouts as he sends out his Poochyena. “Use Bite!” The Pokemon rushes the Trevenant and sinks her teeth in, finally delivering a harsh blow to the Pokemon. The crew slowly whittles the Trevenant down as they use their numbers to overwhelm it. Finally it starts showing signs of weakness. “Almost there, just a little more,” Arlon shouts words of encouragement. “Crocuta, use Bite again!” The Pokemon runs up and sinks her teeth into the Trevenant once again. She starts glowing as she continues to hold onto the Trevenant with her jaws and evolves into Mightyena! “Now it’s mine!” H shouts. He throws a pokeball which strikes the Trevenant right in the face and pulls it inside. The ball falls to the ground. It shakes once.... twice... three times.... and it’s caught! “That was incredible!” H proudly exclaims, completely ignoring Morgan. “Hey, we should-” Dmitri starts. “Very well,” H agrees. The two of them lift Dmitri off the ground and get him on top of H’s Pokemon. H starts leading the Rhyhorn back to the ship while Arlon walks over to Morgan. “C’mon luv, let’s get out of here,” he says to her, offering his hand to help her up. She ignores him and stands up on her own. Arlon shrugs and follows her back to the ship. Once back in space, Arlon sets the Dunsparce to stay in orbit while the crew recuperates from the fight with the Trevenant. He then heads to his room and pulls up the Spacenet to see if he can find any info on the Red Suns’ activities. Arlon strokes Crocuta’s soft fur as he scrolls through various pages. Unfortunately due to the heavy censorship of the Spacenet within the Romanov Union, he really can’t find much of anything. Giving up, Arlon lays back on his bed and tries to get some rest. A short while later, Arlon’s nap is interrupted by the movement of the ship. Being a pilot, Arlon is quite attuned to the movements of the ship and knows that someone has started flying the ship. He gets up and heads to the cockpit to find out what’s going on. When he arrives, he finds Morgan piloting the ship. “I thought we agreed that I’d be the one to fly the ship from now on,” he says. Original image source could not be found. It was on a lot of wallpaper sites with no credit given. “Right then. So where are we going?” he asks. “I need to get away from all this. From these experiments, from them,” she says, pointing to H and the freshly woken and hungover Dmitri who had just walked in behind Arlon. “I don’t care,” Morgan responds coldly. Arlon and Dmitri spend the next several minutes trying to persuade Morgan, but nothing seems to change her mind. Finally, Dmitri gives up and puts Morgan to sleep. Dmitri and H bring Morgan to her room while Arlon sits down in the pilot seat and sets a course for the warp gate. The Dunsparce drops out of warp space at the gate and the ship is once again hailed by one of the Romanov cruisers guarding it. The ship simply sends the Dunsparce docking instructions so Arlon complies and docks with the cruiser. Arlon heads to the airlock and greets the Romanov officer and his men. “Routine inspection,” the officer tells him. The Romanov inspectors find nothing amiss in the cargo hold so they proceed to search the rest of the ship. When they arrive at the bridge, Arlon notices a blinking light on the console, indicating a message. “You have missed call,” the Romanov officer tells him. The Romanov officer gives Arlon a judgmental glance. “It is not polite to keep people waiting,” he says. He then turns and departs from the bridge. The Romanovs disembark from the ship and the Dunsparce is cleared to go through the gate. Arlon flies the ship into the gate with a course set for Sinai space. “So, we’ve got a message,” Arlon announces over the comms. A short while later the rest of the crew joins him in the cockpit. Morgan, who is now awake, seems to have calmed down a bit. “Where are we going?” she asks. “Sinai space,” Arlon tells her. “Oh,” she says, sounding a bit annoyed. He presses the button on the console and the message begins to play: “Greetings GCS Dunsparce. I understand that you have made an interesting discovery. My employer would very much like to acquire a sample and is willing to pay. You can find us at any of these coordinates.” Along with the audio, the message also displays five different sets of coordinates, one of them in the Sinai Sector they are currently headed to. “I don’t think it’s a good idea to sell that stuff,” Morgan responds. Session/Revision Notes: With all the detail I include with these chapters now, I can’t really keep them all at one per session all the time anymore. But for these two chapter sessions, I will be posting both chapters in the same week, just so you don’t have to wait so long. The first three sessions were shorter plus they were written from memory the first time around so even adding in all that detail wasn’t making them long enough to warrant multiple chapters per session. Session 4 was the session where I started taking notes to assist with the writing of the chapters so I already had a lot more to work with when it came time to rewrite this one. Not to mention this session started our precedent for going for around six hours per session. It made sense to split it here because there was the whole business with the Trevenant at the start of this session and the second half was quite different. Speaking of the Trevenant, that was our first “boss fight,” so to speak. But that’s what you get when you inject a tree with warp goo: a shiny, teleporting Trevenant. This was also the first instance of a character breaking. The funny part is that DragonStorm did it completely unintentionally. 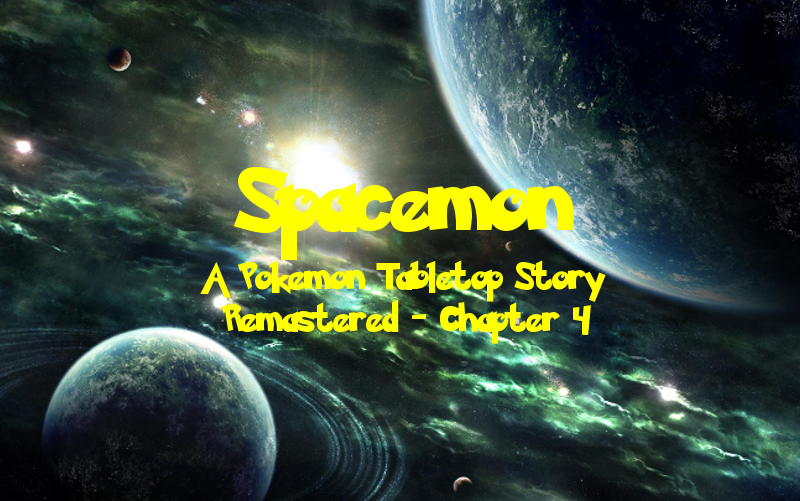 Spacemon: Remastered - Chapter 3: Rumble on Ragnarök!